Every style discerning woman knows that your jewellery collection is not complete without a classic yet sumptuous diamond bracelet, to complement those head turning evening ensembles. This bracelet is impossibly beautiful, with its silver tone bracelet band, set with a number of delicate pear-shaped diamonds totalling 0.5ct. Elegant and refined, this bracelet is a necessary addition to your collection. 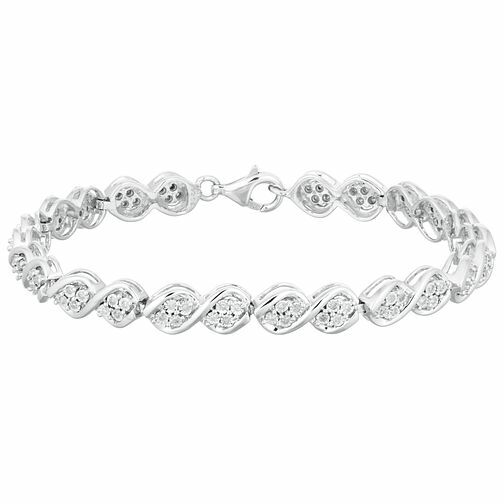 Silver 1/2ct Diamond Bracelet is rated 5.0 out of 5 by 5. Rated 5 out of 5 by Anonymous from Stunning A stunning piece in silver and sparkling diamonds. Chunky and not dainty although still very elegant.